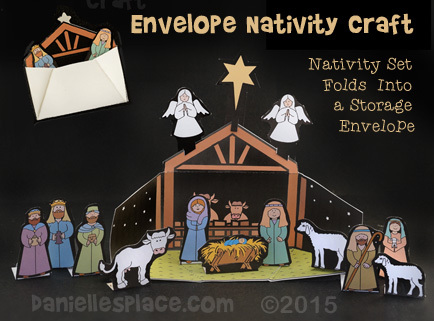 This nativity scene folds into a 3" x 5" envelope in which the pieces can be stored. The patterns come in both black and white and color and have a black background for easy cutting. A tab at the bottom of each piece is folded back to make a stand. This pattern is available to members and as an instant download. 1. Print out the patterns and cut them out. (The patterns have a black background so you don't have to be precise when cutting them out. 2. 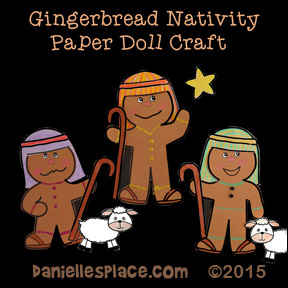 Fold the nativity scene envelope on the dotted lines, at the sides and at the bottom. 3. To make the display fold out the sides, top, and bottom of the envelope and tape the tab on the bottom of the sides to the bottom of the envelope. 4. To store the piece fold up the envelope as shown in the diagram and tape the tab down with a star sticker. 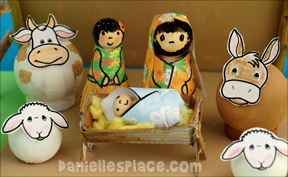 Use this craft to review the Christmas story. 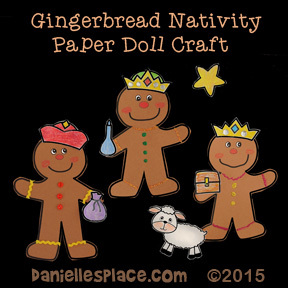 Add craft sticks to make stick puppets and put on a play, or use the figures as Christmas ornaments. 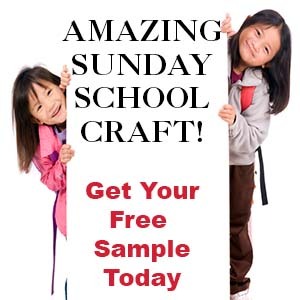 The patterns for this craft are available to members and as an instant download. Star Hole Punch or Foil Star Labels from an Office Supply Store. 1. To make the sky background fold the large paper plate back two inches from the bottom of the plate. (The folded back part will serve as a stand.) Paint the plate black and then use a star hole punch to punch out stars. If you don't have a star punch, you can use Foil Star Labels. 2. 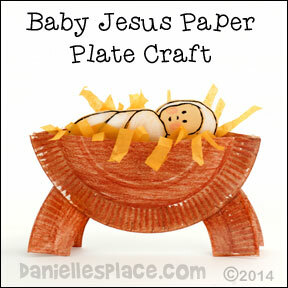 To make the nativity scene cut two inches off the bottom of two lunch-sized paper plates. Cut the center out of one of the plates and color and/or paint around the edge. 3. 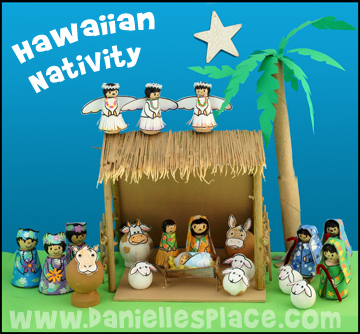 Use the center of the paper plate that you cut out as a template to cut a nativity scene from a Christmas card. Cut the nativity scene a little bigger than the template. If you don't have Christmas cards, you can just draw the nativity scene on the plate. 4. Glue the two small paper plate together top to top, and then glue the plate onto the larger paper plate so that the cut out paper plate and nativity scene are in the front. 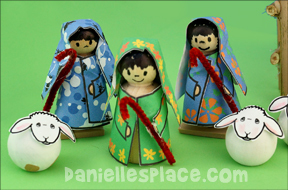 Preschool children will love using this nativity craft for role play. Baby Jesus and the hay can be removed and replaced over and over. The paper plate manger stands on its own. Paper Plates - Snack-sized Paper Plate - Use the cheapest ones you can find. Do not use the ones with the shiny finish. Crayons and paint don't stick to the finish. 1. 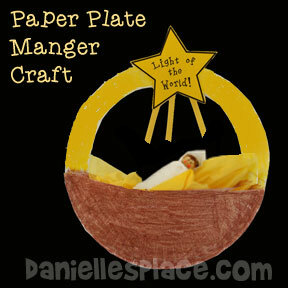 Cut paper plate in half to make the top of the manger. 2. 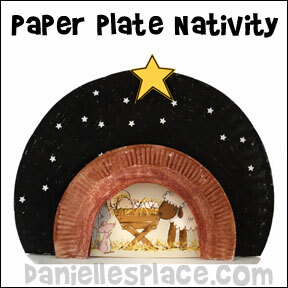 To make the legs of the manger cut another paper plate in half and cut out the center of the halves. 4. Color the paper plate parts with crayons, covering as much of the plate as possible. Do not use paper plates that have the shiny coating. Crayons and paint don't stick to the finish. 5. Once your children have colored the entire plate, you may want to add water color to fill in where the crayon didn't cover. If you use water color before using the crayon the paper plate will get very soggy and warp. If apply the water color paint on top of the crayon, the paper plate will not get soggy because it will only cover the exposed paper. Wipe off any excess water color paint with a paper towel. 6. When the paint glue the legs together so that the backs are together. this will make the legs separate about one inch. 7. Glue the two half paper plates to the legs as shown in the picture. 8. To finish cut up pieces of tissue paper into strips or use feathers. Place the tissue paper in the "manger" and then place the "baby" inside the manger. ©2014, Digital by Design, Inc. - *See Copyright Information- Please do not publish a finished version of the craft on Pinterest without giving Danielle's Place credit for the craft. Danielle's Place reserves the right to publish copies of any versions of this craft that are published on the web site. Paper Plates - Use the cheapest you can find. Do not use the ones with the shiny finish. Crayons and paint don't stick to the finish. 1. Cut 3/4 of the center out of a Paper plate as shown in the picture. 4. Color the paper plate with a crayon, covering as much of the plate as possible. Do not use paper plates that have the shiny coating. Crayons and paint don't stick to the finish. 6. When the paint is dry glue feathers, cut up tissue paper or construction paper, or real straw to the bottom of the paper plate. 7. To finish glue the baby picture on top of the feathers and glue a star to the top of the paper plate. ©2014, Digital by Design, Inc. - *See Copyright Information - Please do not publish a finished version of the craft on Pinterest without giving Danielle's Place credit for the craft. Danielle's Place reserves the right to publish copies of any versions of this craft that are published on the web. Paper Plates - Use the cheapest you can find. Do not use the ones with the shiny finish. Crayons and paint don't stick to the finish. You can use the dinner-sized paper plates or lunch-sized paper plates. 1. Cut 3/4 of the center out of a Paper plate as shown in the picture. Cut another paper plate in half to use as the manger. 2. Cut out star shapes from yellow paper and write "Light of the World in the center of the star". 3. Color the paper plate with a crayon, covering as much of the plate as possible. Do not use paper plates that have the shiny coating. Crayons and paint don't stick to the finish. 4. Once your children have colored the entire plate, you may want to add water color to fill in where the crayon didn't cover. If you use water color before using the crayon the paper plate will get very soggy and warp. If apply the water color paint on top of the crayon, the paper plate will not get soggy because it will only cover the exposed paper. Wipe off any excess water color paint with a paper towel. 5. When the paint is glue the half paper plate to the whole paper plate to form a pocket. 6. 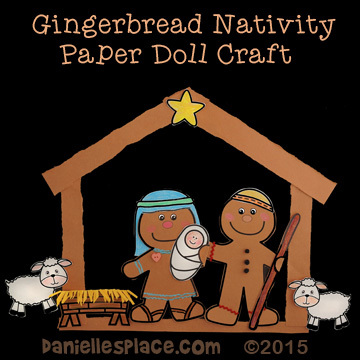 To make Baby Jesus wrap scraps of material, tissue paper, or tissue around a clothespin or craft. Draw on eyes and hair with a marker. 7. To finish crinkle ups squares of yellow tissue paper and place in the pocket, then place Baby Jesus on top of the tissue paper. You can substitute the tissue with strips or material, cut up pieces of yarn, or real straw. Glue strips of yellow paper on the top of the play for rays or use yellow ribbon. Glue a star to the top of the plate over the ribbon. 1. Color or Paint the star yellow. When it is dry paint it with glitter glue. 2. To make Joseph cut the top off a mini jumbo craft stick so it is two inches long. Cut the other end so it is 1 1/2" long to make Mary. Use colored pencils or markers to draw on the faces and bodies. 3. To make the manger color a mini craft stick brown. 4. Cut the end off another mini craft stick and round out the edge. Draw a face and "swaddling clothes" on the stick to make Baby Jesus. 5. Glue the Joseph and Mary figures onto the center of the star. Then glue the manger and Baby Jesus in front of the Mary and Joseph figures. You don't have to have a pattern to make this craft, however the pattern makes it much easier for younger children to make the three panels square. If you don't use the pattern, you can have your children draw scenes on each panel. When your children are finished gluing the panels together, you can have them paint the paper with light oil to make the paper translucent. Have them place the craft on paper towels before adding the oil and then blot any excess oil off with more paper towels. Prismacolor Premier Colored Pencils (I love these because they have very soft lead and work well on the wood shapes.) You can also use markers but the color may bleed a little. 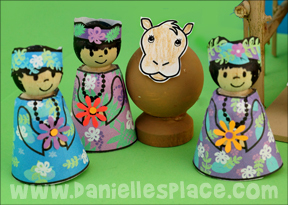 The printable patterns for the clothes, animal faces, head dresses, and manger are available to members. 1. Print out the two pattern sheets and color the patterns. 1. Cut out the angel dresses and wing patterns. 2. Glue the dress patterns to the women-shaped pegs, and then glue the wings to the back of the angel. 3. Use colored pencils or markers to draw in the eyes and hair. 4. Cut short pieces of silver Chenille stems and form them into circles for the halos. Glue them to the angels' heads. 1. Color the Mary and Joseph outfits and head coverings and cut them out. 2. Glue the Mary outfit on the women-shaped peg and the Joseph outfit on the man-shaped peg. 3. Draw the face and hair on the pegs. 4. To make the head covers fold the patterns on the dotted lines and then place glue on the folded tab. Bring the sides of the head dress over the tabs to make darts. Glue the head coverings on the peg dolls. 1. 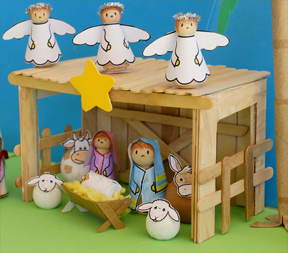 Use the manger and manger leg patterns as a templates to cut the patterns from card board. 2. Fold the manger in half lengthwise and then fold the tabs up. Fold the end tabs over top of each other and glue them together. 3. Glue the legs on the manger as pictured above. 4. 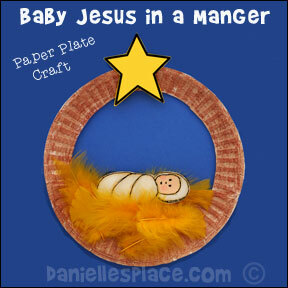 Cut up yellow yarn into small pieces and place in the manger. 5. Cut out the baby blanket and place a small pawn-shaped peg in the center of the blanket so that the head is just below the top of the blanket. Glue the pawn to the blanket. Fold up the bottom of the blanket over the bottom of the peg and glue it to the peg. Press up on the bottom sides of the blanket so that the blanket is up against the side of the peg. Fold over the sides of the blanket and glue them to the top of the peg. 6. Place the Baby Jesus peg in the manger. 1. Color the wise men outfits and crowns and then cut them out. 2. Glue the outfits on the man-shaped pegs. 3. Draw the face and hair on the head of the pegs. 4. Glue the crowns into circles and glue them to the heads of the wise men. 1. Cut out the shepherd clothes and arm patterns and glue the head piece at the darts. 2. Glue the outfits on the man-shaped or curvy-shaped pegs and then glue on the arms. 3. Draw the face and hair on the head of the pegs with a black Sharpie. 4. Cut short lengths of Chenille stem to make the shepherds staffs and then glue them to the hand. 1. To make the sheep paint the one-inch wood ball knobs white and let them dry. Glue the sheep heads to the balls. 3. When the paint is dry glue on the head patterns. 4. To make the cow glue a bottle cap to the bottom of a 1 1/2" ball. Paint the ball and cap white and add brown spots. Glue the cow head pattern to the ball. 1. Cut a piece of cardboard 9" x 7". 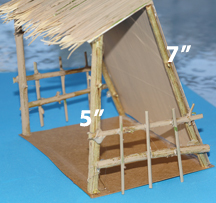 Fold down 2" of the 9" length to make a 2" roof and a 7" side. 2. Paint the cardboard tan to match your grass or reeds. 3. Glue dried grass or reeds to the roof. 4. Cut sticks 7" long for the back of the stable and 5" long for the front. Glue the 7" sticks to the sides of the back and the 5" sticks to the sides of the roof as pictured. 5. Cut four more stick so they fit on the sides and glue them to the front and back sticks. Glue sticks perpendicular to the side sticks to make it look like a fence. This set is also available without the Hawaiian theme. Children color the patterns, cut them out and tape or glue them to the wood pegs and ball knobs. 1. 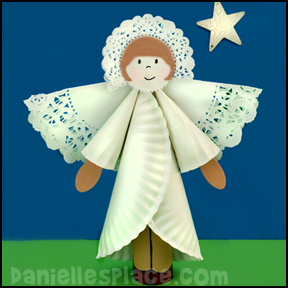 To make the angel's body roll a paper plate into a cone shape and glue it closed. 2. To make the arms cut another paper plate in half and roll down both side on one half of the paper plate and glue the down the rolls. 3. Glue the arms behind the body. 4. To make the wings fold a ten-inch doily in half and glue it to the back of the arms. 5. Cut a paper towel tube in half and glue it inside the angel's body for legs. 6. Glue craft spoons inside the arms to make the hands. 7. To finish glue a four-inch doily on for the head. 8. Use paint or magic markers to draw in the hair, face, feet, and hands. 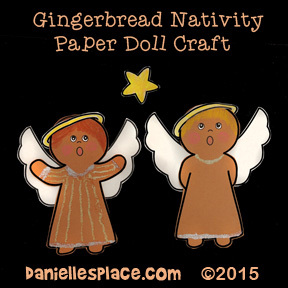 Note: You can use smaller paper plates and doily to make a much smaller angel to hang on your Christmas tree. 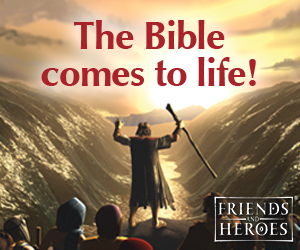 Buck Denver Asks: What's In The Bible? Volumes 1, 10 and Why Do We Call It Christmas? This toy was a hit with the 2 and 3 year olds at MOPS. The children loved using the keys to lock and unlock the doors.